I selected this saying of Einstein’s for the motto of the History of Science Collections blog in part because it thoroughly undermines the positivist philosophy which was rampant in Einstein’s day and which remains ultimately as destructive to science as to humanity. Not all gave in to positivism, of course – novelists like George MacDonald and G.K. Chesterton rose above it, and the “post” in Post-Impressionist was all about the artists’ determinedly anti-positivist protest. Aurier’s words were remarkably prescient, given the revolution in physics that was about to occur with the startling and imaginative revelations of Einstein and Bohr. I came across this passage, so relevant to the history of science, in a book on post-impressionist art by Hans R. Rookmaaker, Gauguin and 19th Century Art Theory (Amsterdam: Swets & Zeitlinger, 1972) pp. 1, 281; translation by Rookmaaker from Aurier, Les Peintres Symbolistes, in Oeuvres posthumes (Paris, 1893), p. 293. My copy of Gauguin is well worn. Rookmaaker helped me make sense of science and the imagination when I was about 19 y/o, long before the days of Amazon, after I finally found a bookstore in Kansas City that could order a publication from a European press. What a treasure was a book so difficult to find! From the same bookstore, Bibliomania, in the Westport district, I also fondly remember obtaining a copy of Erich Heller, The Disinherited Mind (New York, 1975), another work that led me through many cultural by-ways unconquered by Enlightenment rationalism. Thank you, unknown owners of the now-defunct Bibliomania, for materially assisting me on my journey. 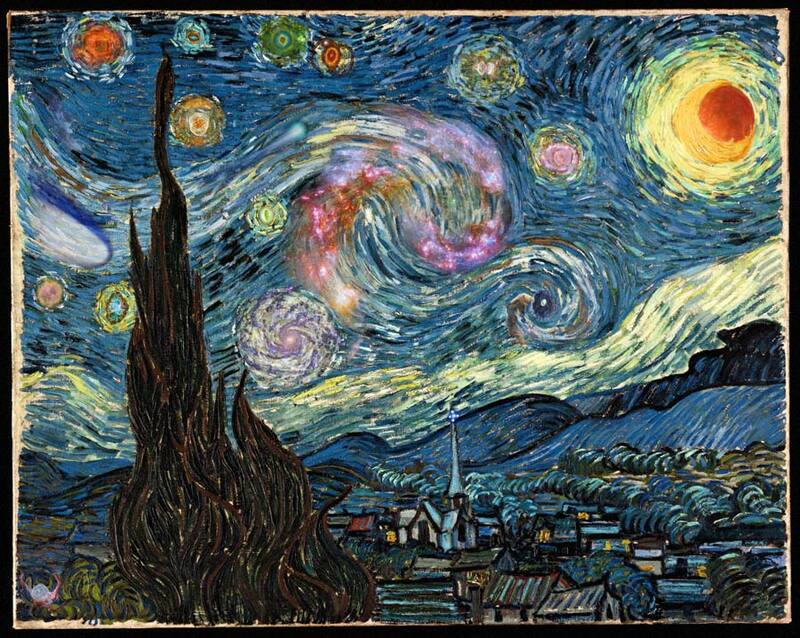 The tribute to Van Gogh below, posted last week on the Astronomy Picture of the Day website, represents a fusion of imagination and knowledge, of art and science, that I’m sure Aurier would appreciate today (this is not Van Gogh’s original painting; click for a larger view). Postscript: See also Imagination Deficit Disorder. This entry was posted in Art-Music-Lit, History of Science, Nature and tagged Albert Einstein, Astronomy, Aurier, Erich Heller, Gauguin, Physics, Van Gogh. Bookmark the permalink.